"350 [Viking] ships came into the Thames and stormed Canterbury and London and put to flight Beorhtwulf, King of Mercia with his army, and then went south over the Thames to Surrey and King Aethelwulf and his son Aethelbald with the West Saxon army fought against them at Oak Field [Aclea], and there made the greatest slaughter of a heathen raiding-army that we have heard tell of up to the present day, and there took the victory." Possible locations for the battle site include Ockley and Oakley Wood, near Merstham, both in Surrey. Our only reference to a battle site is based on the translated passage mentioning Aclea or Oak Field. The region is full of oak trees, so singling one particular wood is rather dicey but based on a number of studies following Pilgrim’s Way as the most likely route of flight, we can trace our way back to a possible battlefield. Travel along Pilgrim’s Way and the countryside is hilly and heavily forested. The route also crosses a number of little rivers such as the Ock or Oke which flow into the River Stour. The region is arable so terrain features should comprise a BUA (Oakley hamlet), the Ock River, and one difficult hill. If using a larger game board (80cm x 80cm) add a second wood and difficult hill. Given the date of the battle players would use the Viking list of Book III/40b which begins in 850 AD. As this is the third engagement after London and Canterbury we can expect some casualties have been incurred by the Vikings. This is represented as one element of blade guarding the camp with plunder. As an option, may call a general retreat after three elements lost as ‘casualties’ are already present in camp. The Anglo-Saxon army are taken from Book III/24b comprising of three Huscarls (4Bd), eight spearmen (Sp) and an element of skirmishers (Ps); no allies are allowed. Break point remains unchanged at four elements. The Vikings are defending and therefore move first. One element of blade is placed in camp guarding the plunder gathered from previous expeditions. The distance between difficult hills will allow the placement of seven elements with the remainder forming a second line. The Anglo-Saxon army deploy behind the river Ock. There is enough open ground to deploy nine elements with the remainder forming a second rank. The river is class II which allows group moves at a reduced rate and banks add a + 1 for the defender. Where exactly is the battle at Acleah? Upon completion of the DBA Middle Anglo-Saxons and Vikings I had reached a crossroad offering a number of directions I could take with the collection. Two possibilities came immediately to mind; do more historical matches or a campaign. After some thought I ruled out the former as this would require many new enemies that would need to be bought and painted and the second idea had less appeal as a Merovingian period campaign had recently been played out. That left a possible third option. Researching information for conflicts of the 9th and 10th century, I did come across many battles that would make interesting historical scenarios for a standard size DBA game. These held my interest for their unique location of the battlefield and others because they are seldom found on the game board; the Rus, Early Polish, Slavs, Welsh and Abbasid to name a few. There is a downside to taking this direction, as with all the Dark Age conflicts, they lack the essential information to construct a well crafted scenario, such as the number of combatants involved or the location of the battlefield. We should deem ourselves fortunate if a chronicler gives a date or mentions a nearby town or waterway. During the past week I have bookmarked about forty battles which for the most part took place in Western Europe and that include Britain, some in Eastern Europe and some in the Middle East. All took place during the years 880 to 950 AD. At the moment I am gleaning through them all and will select six or eight battles that can be reasonably constructed to give a game for both sides. Each of the scenarios will be tested with the best example appearing at the blog. However, readers should be aware that those presented should be viewed as ‘Works in Progress and not a finished product. They are meant to stimulate debate or prompt further research to offer an alternative direction. The preliminary selection of forty battles came from two books; ‘Dark Ages’ by Sir Charles Oman, which offers a great overview from the Fall of Rome to the rise of the East Frankish Empire under Otto I and ‘Germany in the Middle Ages 800 – 1056’ by Timothy Reuter. Also invaluable are a number of translations of medieval chroniclers which are available as e-books from online libraries or Project Gutenberg. 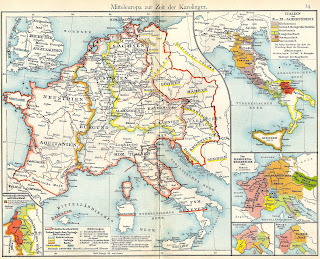 Map: Central Europe at the time of the Carolingians, Putzger Historischer Weltatlas, Leipzig 1877 (from: Internet Archive). Religious differences between the ruling Visigoths and the general population of Hispania came to a head in the early 6th century. 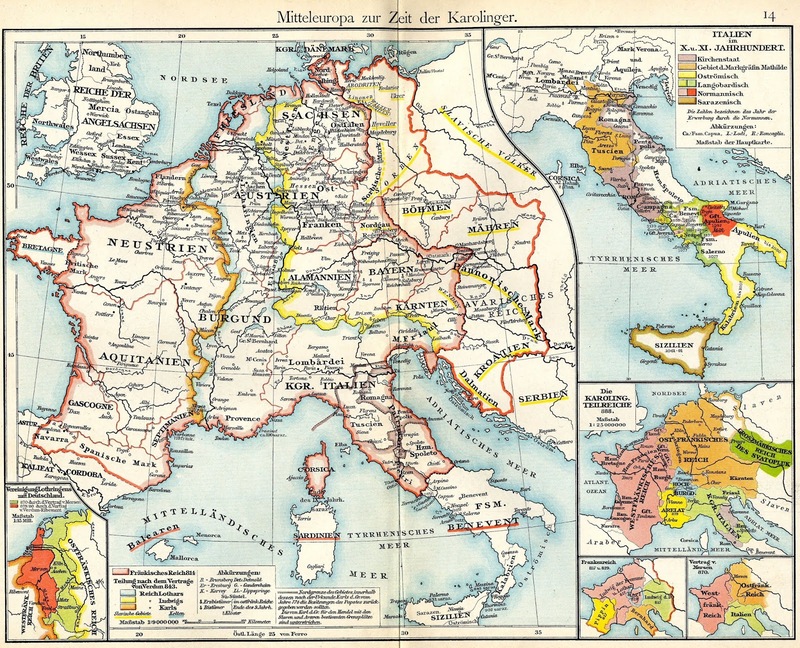 The conflict soon escalated forcing the Merovingians to intercede on the behalf of the orthodox Christians. Not all the Visigothic nobility supported their monarch on religious issues and later dissatisfaction would later lead to civil unrest. In 531, Childebert marched with his army to confront King Amalaric of the Visigoths in Hispania. This was the first of a number of expeditions eventually leading to the possession of Pamplona (542) and the siege of Zaragoza. The majority of these campaigns took place in the fertile region of the Ebro valley. In this series, the Visigoths make use of their city militia (4Ax) which reduces the number of mounted elements. Further, the Franks are Austrasian which gives them a different ratio of spear and warband and they are assisted by Visigothic allies. This open demonstration of disloyalty would lead to the coming civil war between the Visigothic royal houses. The Visigothic city militia and tribal warriors are positioned in centre with skirmishers on the right holding a gentle hill. Visigothic gardingi cover the open flank while in reserve we find the Visigothic noble cavalry. Across the field, Childebert placement of troops mirrored that of the Visigoths. Both sides commit their infantry to open the battle. Frankish warriors quickly disperse Visigothic skirmishers exposing the flank of their city militia leading to their subsequent destruction. The Frankish cavalry and allies charge home to inflict more casualties on the opposite flank. Through a mix up in signals (low pip score), the Visigothic cavalry remained inert eventually fleeing the battlefield as all was lost. Score 4 – 2 for the Franks. The difficult hills, wood and village offered little area for the Visigoths to deploy in. If the Visigoths were to make use of their cavalry they would need to advance quickly to create room to maneuver. The Franks (to the left in photo) were of equal mind as they intended to restrict those Visigothic plans. The opening moves were spent adjusting the alignment of the two lines. As the forces met, combat degenerated into much pushing and shoving with most units holding their ground. Only a unit of Visigothic skirmishers broke ranks to flee for cover. The gap left by the skirmishers opened an opportunity for which the Frankish tribal infantry quickly seized on. Moments later new gaps in the Visigothic line soon appeared giving Frankish cavalry held in reserve an opportunity to deliver a decisive blow. Score 5 – 2 for the Franks. The final battle, both sides faced one another over ideal cavalry terrain. Despite the equal numbers of mounted troops, the Franks placed their horse in a reserve position behind their infantry line. The Visigoths gambled on an all out confrontation and so positioned their cavalry in front. The rough ground proved an inconvenience for the Franks as their battle line moved slowly forward to allow the tribal infantry to keep pace with the infantry on their right. Visigothic militia held the Frankish tribal infantry in check opening a gap which the Visigoths were able to reciprocate and cripple the Frankish spearmen. By now all the Frankish cavalry were committed to battle, leaving no further option to Childebert but to join the battle. Unfortunately, the losses incurred by the Frankish infantry became severe that a general retreat was called for. Score 4 – 2 for the Later Visigoths.